Made with a simple yeasted batter that rises overnight, these waffles come out perfectly light, fluffy, and crisp! Dissolve the maple syrup and water in a small bowl, then sprinkle the yeast over top. Let sit until foamy. In a large bowl, whisk together the flour, baking soda, baking powder, and sea salt. Then, whisk in the warmed milk, vanilla, and melted butter. Once fully combined, stir in the yeast mixture. Cover with plastic wrap and set on the countertop in a cool place overnight. Overnight your batter should have doubled to tripled in side. Stir the eggs into the batter, then pour in enough batter to cover each waffle grate (about 1/2 to 3/4 cup for each waffle, depending on size) and cook for 3-5 minutes, until waffles are browned and crisp. Top with butter and maple syrup and serve! 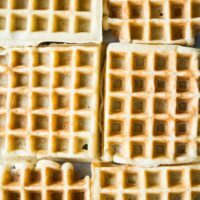 For Dairy-Free: If making these waffles dairy-free, we recommend using almond or coconut milk beverage in place of the milk, along with two tablespoons sugar to make up for the sugar that is present in whole milk. You can also substitute coconut or avocado oil in place of the butter. Note that this substitution will change the texture and the waffles will be slightly less crisp. For egg-free: These waffles will still work if you omit the eggs, but will be slightly less crisp and won’t hold together as well. We recommend leaving the batter out overnight. If you’d prefer, you can refrigerate the batter, just know it won’t rise as much which will result in a change in texture. You can easily double or triple this recipe, and freeze waffles for later! Just make sure you are using a large enough bowl for the batter to rise in.